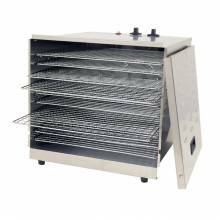 A commercial food dehydrator in your commercial kitchen, butcher shop, café, or restaurant allows you to enhance the way you make basic food! Adding a smoke house and dehydrator to your establishment will let you dehydrate meats, vegetables, fruits and more! A dehydrator allows you to keep the natural flavour of the food, without using extra additives, which makes your menu items healthier! Made from either aluminum or stainless steel, Zanduco’s Smoke Houses are ideal for smoking meats such as sausage, chicken, fish, ribs and jerky, not to mention fruits and vegetables! These affordable kitchen additions will bring you nothing but variety and flavour!